Panourgias Papaioannou was born and raised in Athens. After graduating from the Evangeliki School of Nea Smyrni, he joined several arts and theater clubs. At the University of Athens, he followed his dream and studied English Language and Literature, graduating with distinction during his military service. 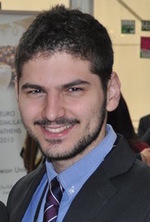 He also studied at the Free University in Berlin as an Erasmus exchange students, and has represented Greece in the CoE seminar concerning youth access to social rights. In his spare time, Panos enjoys reading books and attending the theater. He is an active member on several NGO's that advocate for the rights of deaf and hard of hearing people. Finally he has a great interest in the simulations of the European and Greek parliament and his motto is, "courage is knowing what not to fear”.